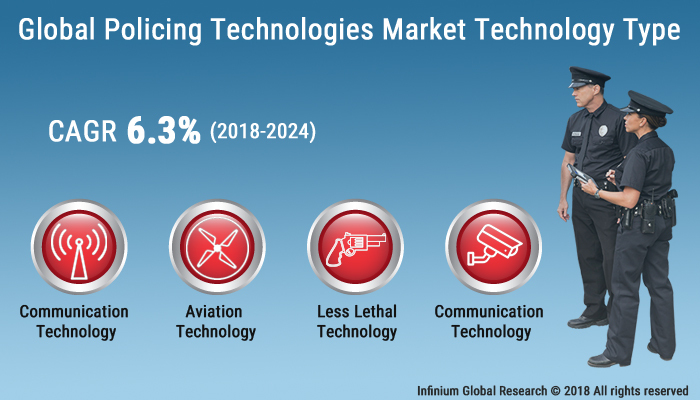 A recent report published by Infinium Global Research on policing technologies market provides in depth analysis of segments and sub-segments in global as well as regional policing technologies market. The study also highlights the impact of drivers, restraints and macro indicators on the global and regional policing technologies market over the short term as well as long term. The report is a comprehensive presentation of trends, forecast and dollar values of global policing technologies market. According to report the global policing technologies market is projected to grow at a CAGR of 6.3% over the forecast period of 2018-2024. Increasing instances of terrorist attacks is anticipated to be the major factor driving the growth of the policing technologies market .Additionally, policing technologies such as video redaction software, facial recognition and license plate readers have helped law enforcement agencies to react rapidly in case of emergency situations. This in turn is anticipated to fuel the growth of the policing technologies market over the upcoming years. However, lack of proper training is expected to be one of the major restraining factor for the growth of policing technologies market over the forecast period. Police agencies need extensive training to become familiar with latest technologies such as facial recognition software, DNA testing, driverless cars, and gunshot locating detection systems. Furthermore, enhancement in technology has resulted in improving the evidence collection, speeding up the detection process and quick response to crimes. This in turn has opened several doors of opportunities for the key players in the policing technologies market. Moreover, apart from communication and video surveillance law enforcement agencies are shifting their focus towards the aviation technology. Among the geographies, Europe dominated the policing technologies market. In addition, France is anticipated to be the major market for policing technologies in Europe owing to the computer and mobile devices installed in the police cars .Furthermore, rising applications of video surveillance technology and image-processing software by the police force is benefiting the European market. Moreover, the complexities associated with the adoption and use of new policing technologies is likely to limit its usage in Europe. The report on global policing technologies market covers segments such as, technology type. On the basis of technology type the global policing technologies market is categorized into communication technology, aviation technology, less lethal technology and detection & surveillance technology. The report provides profiles of the companies in the global policing technologies market such as, Taser International Inc, Aeryon Labs Inc, PredPol, Inc, Reveal Media Ltd, Aventura Technologies, SmartWater Technology Limited, Zepcam B.V, Basler AG, Computer Sciences Corporation and Brite-Strike Tactical Illumination Products Inc. The report provides deep insights on demand forecasts, market trends and micro and macro indicators. In addition, this report provides insights on the factors that are driving and restraining the global policing technologies market. Moreover, IGR-Growth Matrix analysis given in the report brings an insight on the investment areas that existing or new market players can consider. The report provides insights into the market using analytical tools such as Porter's five forces analysis and DRO analysis of policing technologies market. Moreover, the study highlights current market trends and provides forecast from 2018-2024. We also have highlighted future trends in the policing technologies market that will impact the demand during the forecast period. Moreover, the competitive analysis given in each regional market brings an insight on the market share of the leading players. This report will help manufacturers, suppliers and distributors of the policing technologies market to understand the present and future trends in this market and formulate their strategies accordingly.